Lilly Tappern achieved the Midland Qualifying time in the 50m butterfly with a four-second personal best at Grantham. The Grantham Grand Prix takes place over four rounds from January to May. 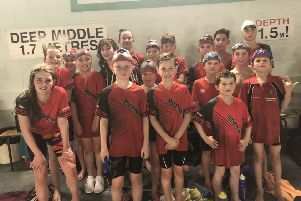 Swimmers compete in three events in each round with all the points combined to award the winners in each age group, 9yrs to 12yrs, at the final meet. Lilly Tappern achieved a perfect hat-trick of personal bests, and also swam her way to two Midland Qualifying times. In the 11yrs 50m butterfly, she took a massive four seconds off her best to finish second in 33.93. She followed that with a 10-second personal best in the 200m freestyle to touch home second in 2:27.21. Both were comfortably inside the Midland Qualifying time. In the boys 12yrs age group, Alex Sadler achieved two top-three finishes with another fine swimming display. Alex, who is looking to improve upon his fifth place last year, came second in the 50m freestyle in 31.21 and third in the 200IM in 2:48.57. Both times were narrowly outside his best. Lucia Karic, who won the 9yrs age group at last year’s Grand Prix, is on course to medal again after a three solid swims. She excelled in the 10yrs 50m backstroke, finishing first in a time of 40.98, came second in the 200m freestyle in 2:49.31 and ended with fourth in the 50m butterfly. Also showing well in the girls 10yrs age group was Grace Edwards, who was sixth overall last year. She came fourth in the 200m freestyle, dipping under three minutes for the first time in 2:59.30, third in the 50m backstroke (42.45) and fifth in the 50m butterfly (43.88). The butterfly was one of the girls’ strongest events of the evening with another four swimmers achieving new PBs to finish in the top seven: Millie Bussey won the 10yrs age group in 43.06 with Maya Sangiorgio finishing seventh (44.12), while Holly Griffin came third in the 12yrs age group in 34.79, and Alice Dovey was seventh in 37.87. Alice and Holly were also among the leaders in the 200m freestyle and 50m backstroke. Alice came fourth in the freestyle in 2:36.71 and third in the backstroke in 36.84 – both new PBs; Holly finished sixth in the freestyle (new PB: 2:37.73) and fourth in the backstroke, just outside her best time. Completing an outstanding evening for the girls was Ella Gerrard, who knocked more than seven seconds off her 200m freestyle personal best to finish seventh in the 12yrs age group, in 2:37.94. In the 9yrs category, William Burdock set a new personal best in the 100IM to finish fourth and swam well in the 50m freestyle for finish fifth. Lewis Tarver led the way for the 10yrs boys with a pair of PBs, coming fourth in the 200IM (3:35.70) and fifth in the 50m breaststroke (52.15), while Louis Sanderson took an incredible 16 seconds off his 200IM time to finish third in the 11yrs age group in 3:01.24. He set another new best in the 50m freestyle, swimming 34.55 to come fifth. The rest of the team, all of whom also achieved at least one new personal best, was: Aaron Sadler, Daniel Partridge, Oliver Shepherd, Joshi Harriss, Joseph Black, Sasha Johnson, Evie Fletcher, Maddie Taylor, Georgia Hunter, Emma Dennis, Jack Cradock, James Townsin, Antony Hall, Maddy Partridge, Daisy Jungmann, Philip Jaklewicz.